Last week, a beautiful thing occurred in the classroom of a 4th grade teacher at Chino Valley School District. It is Autism Awareness Month and every classroom on the California campus had been asked to have each student decorate a paper puzzle piece and hang it on their classroom doors. When Ms. Lisa Moe handed out the puzzle pieces, most of her students were familiar with the idea of autism—and they were aware of the reason for decorating the puzzle pieces. What her students did not know was that autism was present within their own classroom in their fellow classmate: Rumari. With excitement, Rumari rose his hand and said “May I please say something?” Moe nodded and said “of course”, but never could she have imagined what was to follow. She explained in a Facebook post: “Rumari has faced challenges and barriers beyond what any of us will ever be able to fully understand. 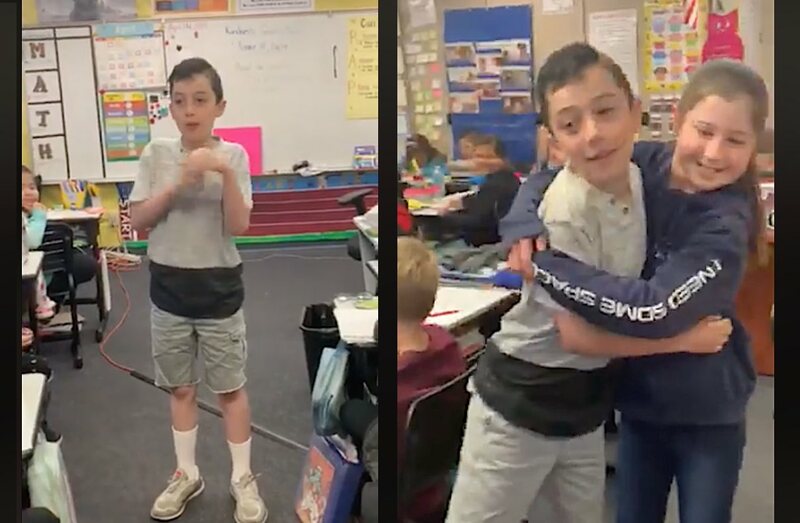 But today, he stood in front of the classroom with full confidence, enthusiasm, and courage and showed us that there is no challenge or barrier that can stop him. Both teacher and students were enraptured and hanging on every word he spoke. For a long time, Moe never thought to get out her phone to capture this moment – but finally, she realized the treasure that was unfolding, and without any of the students knowing, she hit record and captured the final moments of Rumari’s talk, along with the authentic and raw reactions of the other students as they raised their hands to ask questions. Moe’s daily classroom mottos of “Be Kind” and “Yes I Can” merged in that moment and the tears could not be stopped, as his peers expressed their admiration and love for him. STAND UP and Say Something—Share This For Autism Awareness Month! These kids are amazing! Great job, Teacher!